WordWeb Pro Ultimate Reference Bundle 8.03a Retail ~ Apps2Portable | Free Portable Apps for PC ! Wordweb is feature-rich software that does much more than a paper dictionary or thesaurus. WordWeb is truly a Word Web – each set of synonyms is linked to other related sets. Look up “tree”, click on the “Types” tab and you’ll have a list of different types of tree. Click on “Part of” and WordWeb will tell you that a tree can be part of a “forest” or “wood”. Browsing around related words is simple: click on the tabs for synonyms, antonyms, parts, part of, types, type of, similar, see also, and anagrams. To see the definition for one of the related words double-click on the word. You can also use the back and forward buttons. Related words also have “+” and “-” buttons to be more or less specific. For example if you look at the similar words, maybe you’d like to see words that are more loosely similar: you can do this by pressing the “+” button, and go back again by pressing the “-” button. You can add your own technical glossaries (or list of company acronyms, etc) using the option on the “Glossaries” menu. You can also get optional third-party dictionaries, including the Oxford and Chambers dictionaries, shown on separate tabs like the web references. Using the “Find Word” feature you can quickly find words matching a pattern. You can also search a wide range of optional extra word lists using the Find Word window. Here’s what you’d get if you did a punctuation sensitive search in the optional “Compounds and Phrases” word list for phrases ending in “word”. 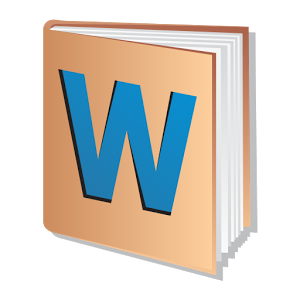 WordWeb Pro is supplied with a 200,000 list of words from the WordWeb database. There are many additional word lists available, including Scrabble, technical, language and proper noun lists. For details please see the ordering page. Use the “full text” button to search for text appearing in any definition. For example search for “female fox” and it will find the definition of “vixen”. Click the X-Ref button to cross-reference to other installed dictionaries. Many common dictionaries are detected automatically, but you can customize the list to work with almost any third-party software. Select “New Definition” from the “Edit” menu to add a new word (or set of words) with definition. You can also import and export to common spreadsheet-format files. Use the bookmark feature to remember useful words. There’s a feature to randomly look one up as a way of helping you remember vocabulary. WordWeb also builds a list words you’ve looked up, so you can go back and check you remember definitions. You can also export the list to a text editor, delete items, or delete the entire history list. If you are looking up a word from a document you are editing, you can select any word and press the “Replace” button to substitute a synonym. You can also copy to the clipboard parts of definitions, all of the definitions, the selected related word, or all of the listed related words (or anagrams/words matching a pattern). Annoyed by URLs in e-mails or documents that don’t open when you click on them? Just select the URL, press the WordWeb Hotkey and it’ll open it in your web browser for you. You just need a computer running Windows XP, Vista, Windows 7, Windows 8 or Windows 10.